Progressive Care Inc., through its subsidiary PharmCo, LLC, is a South Florida provider of prescription pharmaceuticals, which specializes in anti-retroviral patient management, long term care, and durable medical equipment (DME). The Company, is focused on developing the PharmCo brand and adding business elements that cater to specific under-served markets and demographics. This effort includes community and network based marketing strategies, introduction of new locations, acquisitions, and strategic collaborations with community, government, and charitable organizations. As a company that specializes in the service of patients with special needs, our mission is to treat these patients with the utmost of care, privacy and respect. Progressive Care is devoted to improving the quality of life of all patients through increasing access to vital medications and equipment, raising awareness, and providing education and other services to local communities and long term care institutions. PharmCo, LLC is a wholly-owned subsidiary of Progressive Care, Inc.
PharmCo, LLC was established in 2006 as Florida Limited Liability Corporation with the goal of becoming a premier pharmacy in the South Florida community. The past 6 years has brought about dramatic changes for the pharmacy from becoming part of a publicly traded company (Progressive Care, Inc.) in 2010 to specializing in the care and management of patients with special needs. PharmCo prides itself on the level of service it provides to individuals and institutions in need of anti-viral medications, durable medical equipment, and long term care. The company is dedicated to treating its customers with compassion, professionalism, privacy and respect with a commitment to education, support and community outreach. Investor Relations indicated that Open Letter to Shareholders is expected to be released during the week of Jan 4, 2016 ; also, that the letter will be in a similar format to the Letter released to the OTC Markets website on December 29, 2014 , including company expectations for 2016. 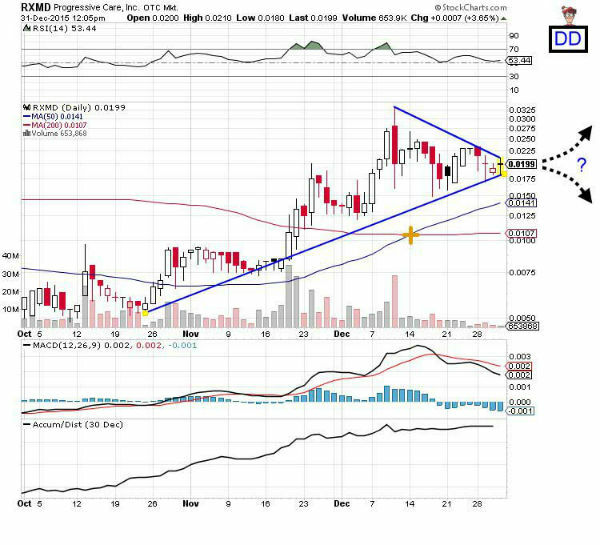 Removal of the yield sign on OTC Markets and the change in the designation for Progressive Care, Inc. (RXMD) from "OTC Pink Limited Information" to "OTC Pink Current Information" is pending; the action may become effective at any time. Progressive Care Names Shital Mars Chief Executive Officer . Ms. Mars, who currently serves as the Chief Operating Officer, will succeed Alan Jay Weisberg as of January 4, 2016 . Mr. Weisberg will remain the Chief Financial Officer of the Company as well as Chairman of the Board of Directors. Updated Attorney Letter submitted to OTC Markets Jan 6, 2016 - this is for OTC Markets yield sign removal, and designation for Progressive Care, Inc. [RXMD] to be changed from "OTC Pink Limited Information" to "OTC Pink Current Information". 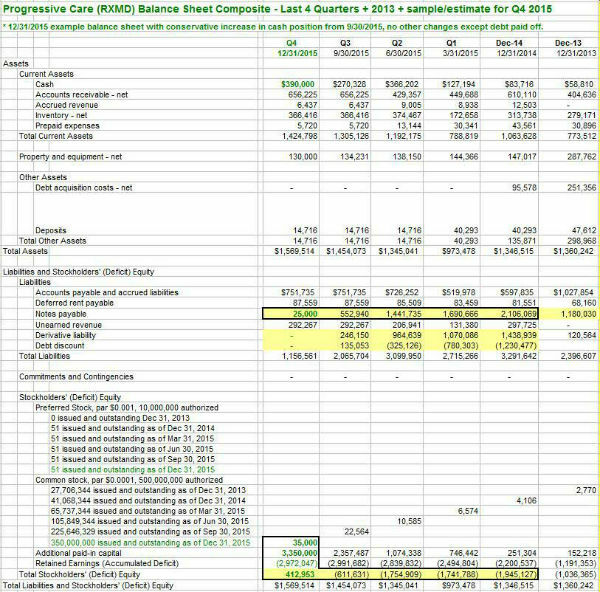 Progressive Care, Inc. (RXMD) issued 282,275,000 shares of common stock from Q4-2014 through Q4-2015 in a 3(a)(10) transaction to clear all debt from the balance sheet . The company announced the closing of the 3(a)(10) transaction and the clean balance sheet on Dec 10, 2015 . 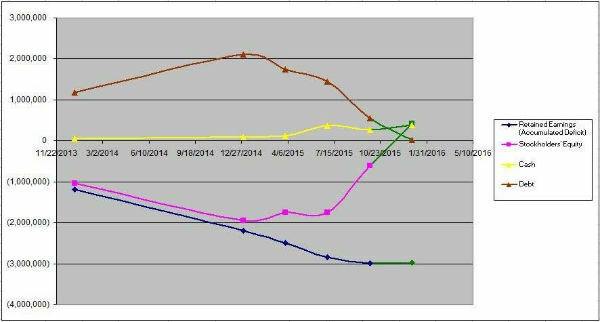 Effects of the debt payoff on financials can be seen in charts below. The following financial data was compiled by a shareholder, MoneyForNuthin, from quarterly and annual reports filed by Progressive Care, Inc. to OTC Markets. MoneyForNuthin is not affiliated with the company. 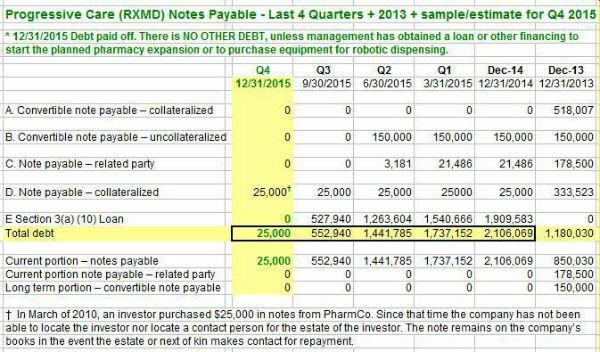 Projections made in green text (spreadsheets) and green chart line extensions for Q4 2015 data points are made by MoneyForNuthin - these projections did NOT originate from Progressive Care, Inc. This information is provided as an aid to investors for their due diligence, and is not intended to be used directly as a guide for investing. Do your own DD, trade at your own risk.